Saint Anejo is a cool new place in the Gulch. As an M Street development, they spared no expense and did it out right. 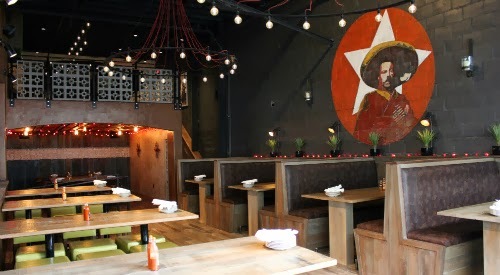 Saint Anejo is a new and hip Mexican cantina with a twist. Now, those of you that know anything about the Gulch in Nashville are probably thinking, " why would they put in another gourmet Mexican cantina a half mile from one another?" I was certainly thinking the same thing, but being the Mexican lover that I am, I was willing to give it a shot. Saint Anejo is more of a casual spot with a different flavor. It definitely competes with Cantina Laredo because you're not comparing apples to apples. Although both gourmet Mexican, they are somehow different. We had the spicy crab Guacamole. Very delicious, but a small portion and a little overpriced, ringing in at $14. The entrees were more reasonable. The chicken enchiladas were delicious and only $13. (I know this sounds like a lot when compared to an everyday Mexican joint, but this is no average Mexican joint. We also got the strawberry flan. Again, very delicious but a tiny little portion (not enough to share, even though we did) and it was $7. Overall, the food was really delicious, but just a tad overpriced. The ambiance and atmosphere was fun. The walls were covered in skull velvet wallpaper and fun industrial style lights adorned each booth. Check out Saint Anejo in the Gulch! You'll be glad you did!